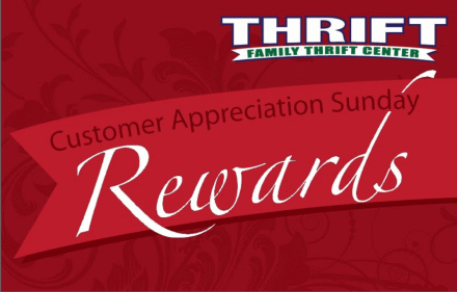 At Family Thrift Center, our frequent shoppers benefit from extra rewards. Our loyalty program shoppers who shop with us Monday through Saturday will accumulate points which can be used for discounts on any items purchased that following Sunday! With the Customer Appreciation Sunday Rewards Program you simply give your phone number to the cashier at the time of your Monday through Saturday purchase to accumulate points. Every dollar is a point. 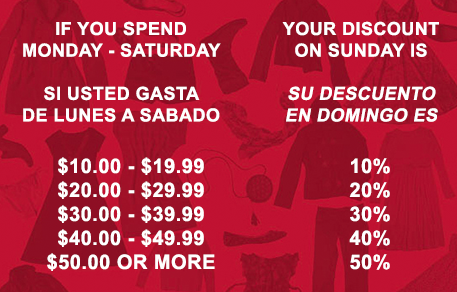 Shop on Sunday to redeem the savings you’ve accumulated the previous week! It’s as simple as that. Family Thrift Center has a strict no refund, no return, and no exchange policy. All Family Thrift Center all items are sold “As Is” and all sales are final. Designer goods offered for resale cannot be guaranteed authentic. Items with loose or missing price tags must be reprocessed therefore cannot be sold.